This page will walk through Spring Boot Filter example. A Filter can be registered using either FilterRegistrationBean class or @Component annotation or @ServletComponentScan annotation. FilterRegistrationBean registers a Filter as Spring bean and it provides methods to add URL mappings, set Filter order etc. When we register a Filter using Spring @Component, we can set Filter order using Spring @Order annotation but there is no way to change default URL mappings in this case. When we register Filter using @ServletComponentScan, our filters must be annotated with @WebFilter annotation and we can add URL mappings using its urlPatterns attribute but we cannot set Filter order in this case. @ServletComponentScan works only when using embedded server. 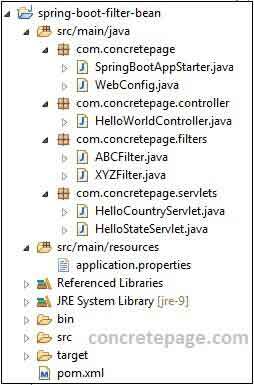 Here on this page we will provide complete Spring Boot Filter example with filters, servlets and Spring controller. FilterRegistrationBean registers filters in Servlet 3.0 + container. FilterRegistrationBean registers a filter as Spring bean. Find some of its methods. addUrlPatterns(): Adds filter URL mappings. Find the JavaConfig to register ABCFilter and XYZFilter classes. To add filter URL patterns we can use addUrlPatterns() or setUrlPatterns() methods of FilterRegistrationBean. Suppose we want to define URL patterns as /app1/* and /app2/* using addUrlPatterns(), it is achieved as following. If we are using setUrlPatterns(), it is achieved as following. When we register filters using FilterRegistrationBean, we can set filter order using its setOrder() method. Find the code snippet. Ordered.HIGHEST_PRECEDENCE: This is the highest precedence. Ordered.LOWEST_PRECEDENCE: This is the lowest precedence. Lower the order number, higher the precedence. Find the sample precedence order. It is usually safe to leave the filter beans unordered. Spring boot provides them default order and that is usually Ordered.LOWEST_PRECEDENCE. If we want to run our custom filters before or after any in-built filter such as Spring security filter, we need to order them using FilterRegistrationBean. It means if we want to run our custom filter after Spring security filter, we need to create our own FilterRegistrationBean for Spring security filter and specify the order. We can register a filter using @Component and set order using @Order. Create a filter implementing Java Filter and annotate it with Spring @Component as following. The default filter URL pattern is "/*". We cannot change it in case we register filter with @Component annotation. If we want filter URL mappings, we should register filters using FilterRegistrationBean. To register a filter in Spring Boot, we can use @ServletComponentScan and the filter should be annotated with @WebFilter annotation. We need to use @ServletComponentScan with @Configuration or @SpringBootApplication annotations. @ServletComponentScan in Spring Boot will scan servlets annotated with @WebServlet, filters annotated with @WebFilter and listeners annotated with @WebListener only when using an embedded web server. Suppose we have two filters annotated with @WebFilter as following. Now use Spring boot starter Main class with@ServletComponentScan to scan above filters. The annotation @WebFilter has the attribute urlPatterns to map URLs as following. When we register filters using @WebFilter then we cannot order them in Spring Boot. @WebFilter does not provide any attribute to set order. We also cannot use Spring @Order annotation, because Spring does not identify @WebFilter annotated class as Spring bean. @WebFilter is a Java annotation and not a Spring annotation. If we want to set order we should register our filters using FilterRegistrationBean. We will provide here Spring Boot filter complete example with FilterRegistrationBean class. We will create two filters, two servlets and one Spring controller with a method in our demo application. We will register filters using FilterRegistrationBean and servlets using ServletRegistrationBean class in a JavaConfig. Now find the complete example. Now find the Java files. Now we are ready to test the application. Run the following URL. We will get following output in console.